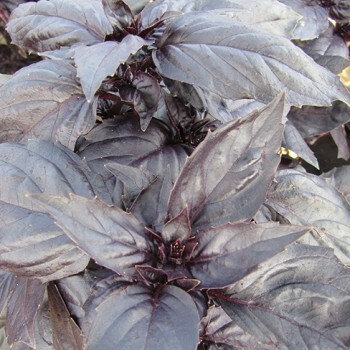 Basil Red Rubin is a purple red basil variety. Basil is a kitchen herb often used in Italian and Mediterranean cuisine. The leaves of Red Rubin are full of flavour, very aromatic and light till dark purple-red in colour. This colour gets darker in the sun. This basil is also very decorative in the garden and flower borders. Don't cook the leaves to long to prevent loss of flavour. You can use this herb fresh and finely chopped to add a delicious touch of flavour to a fresh cooked dish. Basil is an essential herb in Italian and other Mediterranean cuisines. It's the main ingredient of homemade pesto. It's also delicious in pasta sauces, soups, salads, marinades, different Italian dishes and in Salad Caprese. Basil is very delicious in combination with tomatoes, aubergines, courgettes, garlic and cheese. Don't cook the leaves of basil Red Rubin to prevent the loss of flavour. You can add the leaves of this basil to the dish after cooking. Finely chop the fresh leaves and add them to pasta sauces, soups, marinades, omelettes and on pizza's. Non hardy annual. Sow indoors from April on. Use seedtrays filled with moist potting soil. Sow shallow and thin. Press the seeds gently on to the soil, but don't cover them. Basil is a light germinator. Use a spray bottle to water the seeds, so you don't disturb them. Cover the trays with a lid to retain the moisture. Keep the temperature as even as possible and don't let the temperature drop during the night. Remove the lid when the seedlings emerge. Transplant the seedlings, when they're large enough to handle, to seperate pots. Harden the seedlings of by putting them outdoors on a sunny place with shelter during the day for about 10 - 14 days, in the beginning of May. Plant them after this period on a very sunny and sheltered plot, from the middle of May, when there's no longer any danger of nightfrosts. Keep the plants 20 - 25 cm apart. Sow outdoors from the middle of May, when there's no longer any danger of nights frosts. Sow on a sunny plot with shelter. Sow thinly and shallow and press the seeds gently on to the soil. Don't cover them, because basil is a light germinator. Thin the seedlings, when they're large enough to handle, to 20 - 25 cm. Water them during the germination and with drought. Never let basil dry completely out. Pick the leaves from the top of and keep picking to stimulate new growth. Basil needs a lot of light, warmth and water to grow. It needs at least 5 - 6 ours of light each day to thrive.